CTE/CTAE month starts tomorrow and what do you have planned? Now is the time to highlight the different areas of CTE including FACS and let everyone know what your program is all about. In addition, it is also a great time to fully inform your students about the benefits of taking CTE classes. Check out 7 unique ideas below for celebrating CTE month. Invite a different guest speaker each day (for a week) or once a week that holds a different career related to FACS. Complete a community service project each week. For ideas click here. Encourage the entire CTE department to decorate their doors based on their area/careers. 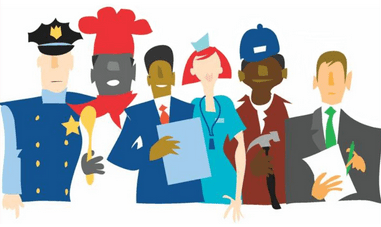 Create college posters for schools that offer CTE related careers (especially FACS) and display in the hallway. Get together with the CTE department to create a promo video for all CTE programs. If they don’t want to participate, create one just for FACS! Takeover school announcements highlighting different students, clubs, and activities for the month: CTE Student of the week, CTSO of the week, CTE Teacher of the week, etc. FACS Classes can do cooking demos, conduct food tastings, put on a fashion show, do a childproofing your home presentation, and so much more!! Automotive can perform oil changes, wash cars, check fluids and air pressure in tires. Nursing/Health Service can conduct basic pre-screening checks for blood pressure, give presentations on yearly checkups, and more! Business/Marketing classes can help people create email addresses, develop resumes, design business cards, etc. I hope you get the idea!!! Just be creative and get out there and promote your program. We are losing programs every day and we need to stand out and show the world and community that we are needed for everyday survival.